4 - 5................Alf vom Hagenfreund. 4,4 - 5,5..........Alex von Kleinwaldheim. 5 - 4,5.............Alf von der Geer. 5,5 - 5.............Dieter vom Willersee. “This black male was bred in Germany and gained the Bundessieger title at a CACIB show in Stuttgart in 1966 under a German Judge Mr Rothfuss. He described the dog as follows: “this male is an outstanding specimen with no serious faults, he is balanced and powerful but could have a stronger head'. However according to other experts Andy had a very, very bad head. They said he had a bitchy head with a weak underjaw. Mr. O. Vogel even said it was a mistake to make the dog a Bundessieger, because he would be used too much for breeding. Costa: dam of the von der Wachenburg “A, C” litters (Amarilda). Ero: sire of the von der Wachenburg “A” litter (Amarilda) and of Bamby's Pride “U, R” litters (Utta). 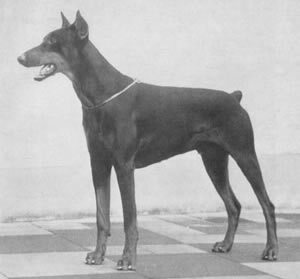 Flint: SchH 3 and sire of the von Beelen “C” litter (Cäsar). Daisy: dam of the vom Hessenland “G” litter (Gitta). Andra: dam of the von der Stollburg “J” litter (Jago, Jaro).